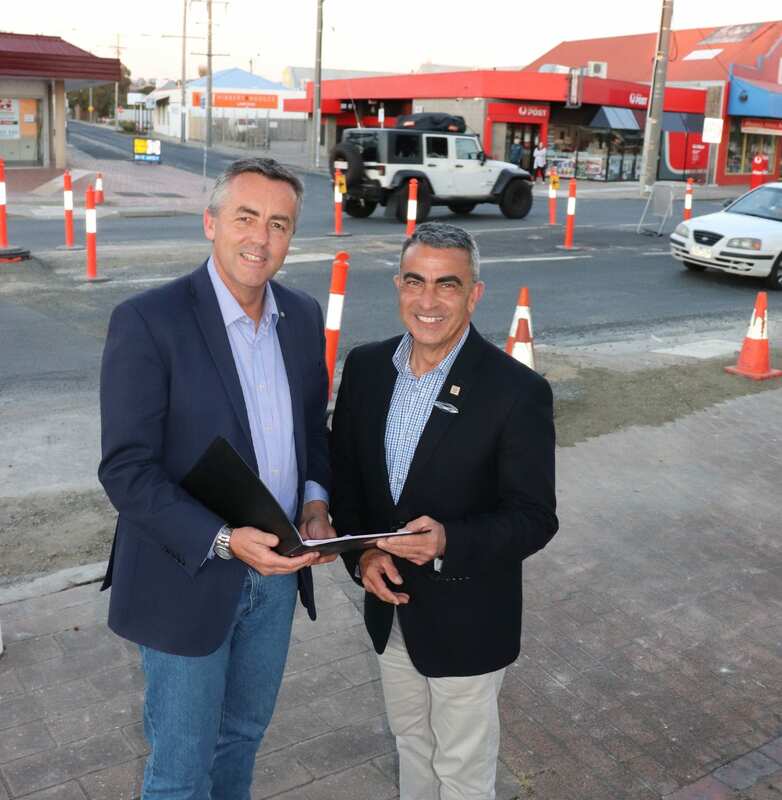 The Nationals Member Darren Chester, pictured with East Gippsland Shire Councillor Joe Rettino, says two new pedestrian crossings across The Esplanade in Lakes Entrance should be finished for the summer holidays. Two new pedestrian crossings in Lakes Entrance should be completed by the end of the year in time for the busy summer holiday period. Federal Member for Gippsland Darren Chester secured funding of $5 million for improvements to The Esplanade as part of a $50 million upgrade of the Princes Highway, east of Sale. Mr Chester said the pedestrian crossings would better link the main shopping strip to the shared pathway on the water’s edge. The pedestrian crossings are being built near Australia Post at the Barkes Avenue intersection and near McDonalds east of Mechanics Street. “The new lights, kerbing, footpaths, pram crossings and raised sections of road will provide safer crossing points for locals and visitors,” Mr Chester said. Mr Chester said the pedestrian lights were a part of the broader package of road safety upgrades underway in Lakes Entrance and other towns along the Princes Highway. “These lights will provide peace of mind to anyone crossing the Princes Highway, especially during holiday periods when there is an influx of families and children enjoying all that Lakes Entrance has to offer,” Mr Chester said. Reduced speed limits and traffic management will be in force while the works take place and electronic signs will operate in the area to alert drivers. The decision to install pedestrian lights followed community feedback and a recommendation in the East Gippsland Shire Council’s Lakes Entrance Masterplan. The $50 million upgrade of the Princes Highway from Sale to the NSW border is jointly funded by the federal and state governments.